Flickr Photo Frame makes your iPhone or iPad a digital photo frame easily. Flickr Photo Frame plays slideshow using photos on Flickr, so you don't have to bring photos into your iPhone/iPad. It can also play photos of users in your contact as well as your own photos, you can see photos of your family who live far away from you. Please create account at Flickr. If you want to use your own photos for slideshow, please upload the photos to Flickr. If you create Sets and adding photos to them, you can easily change photo set to be used for slideshow. If you want to use photos of other users, please add them to your contact on Flickr. To see photos which the user publish to only family, you have to add the user to your contact as family. You need the user's permission on adding them to your contact. First time you use this app, it shows button to login to Flickr. Please tap this button and login after Safari starts and show Flickr Login page. * If you already have logged in Flickr with Safari, this step will be skipped. After you logged in, it shows page which request your confirmation to allow this app (FlickrPhotoFrame) to access your data on Flikcr. Please tap "OK, I'LL AUTHORIZE IT" to give this app the permission. This app starts again and get your photos to play slideshow. Please tap the screen to show status bar and you can go to settings by tapping [Settings] button. SettingsYou can configure following items. By default, your all photos on Flickr are used for slideshow. 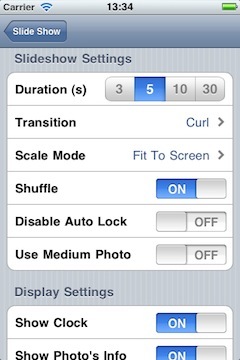 You can change which photo set including other user's photo set is used for slideshow by tapping this item. Duration of showing a photo. You can select from 3, 5 ,10 and 30 seconds. Effect of transition to next. Way to scale a photo. In [Normal] mode, photo is scaled to display whole of photo. 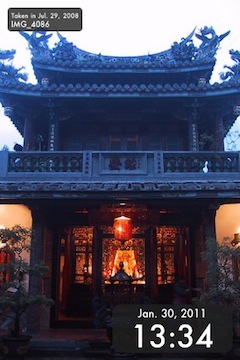 In [Fit To Screen] mode, photo is scaled to fill whole of screen. * aspect is kept, so part of photo may not displayed. Disable Auto Lock while slideshow is playing. If this option is set ON, slideshow uses only middle size data of photos. It is useful for case you use this app with low speed line. Show taken date and title of the photo. If the photo doesn't have these attributes, nothing is shown. You can select date format of clock. You can select time format of clock. You can select a font used for clock and photo's information. This is the user who read photos for slideshow. By tapping this item you will log off. This is the user who own photos for slideshow. By default it is you and you can select a user from your contacts by tapping this item. If the owner user has photo sets, you can select a set for slideshow. Ads are displayed for 15 seconds every 5 minutes. Number of photos used for slideshow is up to 500. * We're going to improve it in future version. Duration of depends on line speed. Copyright 2011 Ukulele Trip All Rights Reserved. About license of ObjectiveFlickr, please read the "ObjectiveFlickr" item in Settings page.